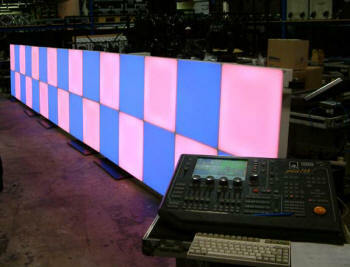 Aptly named, the DYNO PANEL color changing lighting panel offers unrivaled mood generation as part of an entertainment, retail/architectural or business environment, through subtle color and intensity changes and movement through fades, chases and matrixes. Consisting of panels of various sizes, the DYNO PANEL Series produces a diverse range of colors and shades from its state-of-the-art LED light source. The DYNO PANEL color changing lighting panel has been configured to offer total creative flexibility for professional lighting designers and specifiers. The super bright LEDs used in the DYNO PANEL offer maintenance free operation, and because LEDs generate virtually no heat, DYNO PANEL units can be generously employed in public areas where traditional light sources are unsuited or prohibited. With a virtually infinite range of colors, shades and hues the DYNO PANEL can faithfully represent the seasons and themes being displayed. The DYNO PANEL shelf unit is ideal for back bar displays and with the all day, all night operation of a modern bar and restaurant venue, DYNO PANELs are inherently suited to this demanding environment, being virtually maintenance free. Due to the inherent technology of LED, light is confined to the panel and does not pollute the merchandise being displayed or highlighted. The DYNO PANEL acts purely to draw the eye to the product. Any product suddenly has that irresistible added value when enhanced by the DYNO PANEL. This DYNO PANEL come with DMX capabilities can be used both indoor and outdoor for its special character of waterproofing outdoors and indoors to create various lighting effects such as color changing. color chasing color fading and color flashing. Its square shape is popular with users. 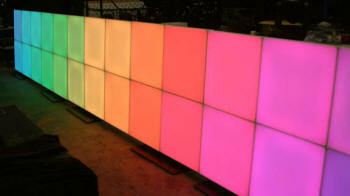 DMX compatibility enables an infinite variety of settings, sequences and lighting scenarios and looks. IR remote controller is also available with preset modes and sequences.